Stockton Town are pleased to announce some news regarding our 3G Development. It may of seemed as if nothing had been happening for the last couple of months in the aftermath of the problems on the School Site we share with OLSB. That has been far from the case and I can now tell you that we are about to enter a full partnership with Stockton 6th Form College to ensure this development goes ahead at the Football Club. This will involve the build now taking place on the 6th Form College Site if Planning Permission is granted. This will allow the huge benefit to the College with their Curriculum delivery and potential developments for their sporting aspirations but also allow the Club to benefit by providing us better all year round facilities. The Planning process will take a number of weeks and we are hopeful that a decision will be reached on these Plans during July. All that said there is a change to the scheme brought about by the size of the College Site being unable to accommodate both a 3G Pitch and the Clubs aspirations to progress in the National Pyramid through developing its Ground. Therefore I can inform you that the new development will see a 3G Stadia Pitch developed that will be used in the same way as a standard 3G Pitch but will also be suitable for the Club’s 1st Team to play it’s League Fixtures upon. This is a fantastic opportunity for both the Football Club and Stockton 6th Form College. 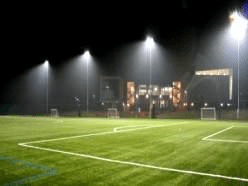 The full scheme includes the provision for the Floodlighting required, Changing Rooms, Hospitality, Toilets and Spectator Stands that will allow the Club to progress in the National Pyramid and a proposed Site Plan that has been submitted for Planning can be viewed by following the link below.